Tickets for the 2012 season at the Ravinia Festival go on sale Thursday, April 26. 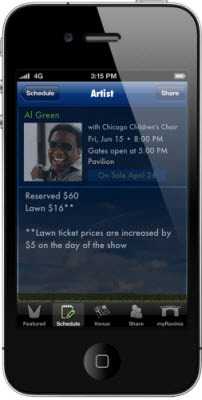 Offering up a near-nightly soundtrack to Chicago summers since 1904, this will be the first year you can use a special Ravinia smartphone app not only for your purchase, but also for connecting with friends while attending a show. If you have never been to a concert at Ravinia (located north of Chicago in Highland Park), there are two seating options: a reserved seat under the pavilion (with views of the stage) or a GA lawn ticket which is generally under $20 for most shows, with no sight of the stage. The benefits of a lawn seat are many, besides the lower price. First, you can picnic (with alcohol) on a blanket under the stars or beneath some of the ancient leafy trees on the site. Secondly, you can corral all of your friends together for an outing where everybody gets to enjoy some cheese, wine, and music in the fine summer weather. The "corralling" however, is the tricky part, especially given Ravinia's lack of distinct landmarks besides "right" "left" and "tree." Typically, there's a lot of people standing up with their cell phones clutched to their ears and waving with the other arm, that is, until the sun sets. 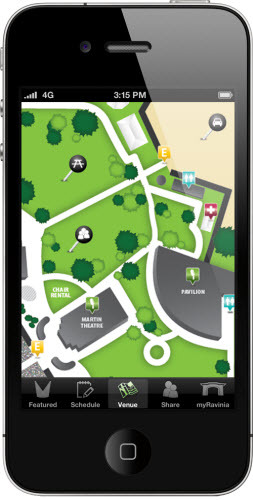 But this year, you can use a new iPhone and Android app to improve your Ravinia experience. Available now through the appropriate app stores (depending on your device), you can view the schedule, buy tickets (starting Thursday), and use the "share your experience" tab to connect with friends at the venue. You can also drum up interest with friends by sharing the shows you want to see with your friends via email, text, Facebook, Twitter, Tumblr, or even LinkedIn. The app was developed by Aqueduct Development LLC , and partner John Fitzsimmons noted, "Helping people was the main focus behind the app. We want it to be useful. So beyond social sharing, and the geolocating map feature we also added a simple 'Directions to Ravinia' feature where with a couple clicks you can get driving, public transit, or even walking directions to Ravinia." In addition to all that, there's also a mini-gallery showing the Ravinia Festival's three different venues — Bennett Gordon Hall, the Martin Theater and the Pavilion — so you can get a feel for each of them (great if you're not as familiar with their indoor concerts, and classical performances). Aqueduct Development is no stranger to working to make a festival setting more enjoyable. 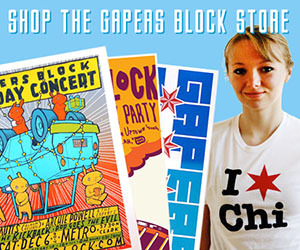 They also won Lollapalooza's Hacklolla contest in 2011 as well as an unofficial North Coast Music Festival app. The real tests of the Ravinia app will be once tickets go on sale tomorrow, and once again when the gates open and that lawn starts filling up this year. 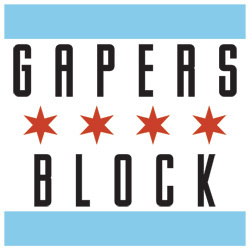 You'll either be able to get a signal and geolocate yourself and then relax with a nice plastic cup of "Two Buck Chuck" while you wait for the next Metra train to drop off a few hundred music lovers. Or, we'll see just as many arm-waving, cell phone-holding patrons, trying to find old so-and-so before Santana goes on.